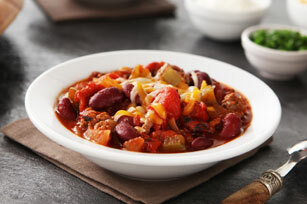 Yeah, this chili is cheesy. But it's also beefy and hearty, with a base of kidney beans and fire-roasted diced tomatoes. Brown meat in large saucepan on medium heat; drain. Add peppers, onions and seasonings; cook 5 to 6 min. or until vegetables are crisp-tender, stirring occasionally. Add all remaining ingredients except cheese; mix well. Cover; simmer on low heat 30 min., stirring occasionally. Garnish each serving with 1 Tbsp. BREAKSTONE'S or KNUDSEN Sour Cream and a light sprinkling of chopped fresh chives or cilantro. For a spicier chili, add 1 small chopped jalapeno pepper or a few drops of hot pepper sauce along with the other seasonings.